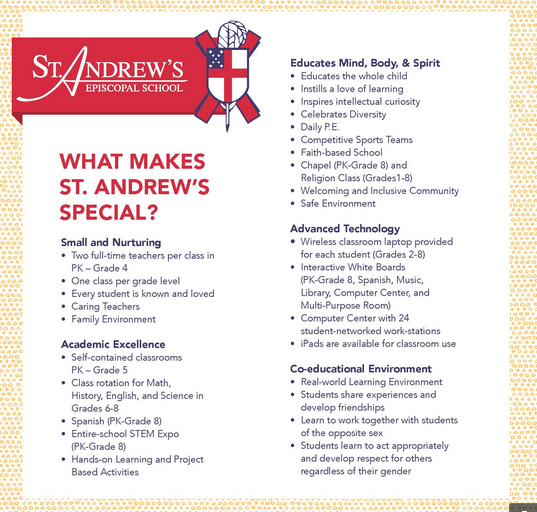 St. Andrew’s has a wonderful tradition called “morning exercise.” Our entire school meets for a morning assembly with a prayer, pledge and song led by our students followed by a few words from our Head of School. Today, our Head of School, Mel Brown, read one of his favorite poems: “Sure On This Shining Night,” by James Agee. After the reading, Mr. Brown and his wife, Inka, performed the beautiful and contemplative song by Samuel Barber that uses the poem as the text. Listen to the beautiful music and singing.